North Sikkim is one of the unexplored beauties of India which offers pristine beauty of snow covered mountains, majestic waterfalls, blessed flora and fauna and breathtaking views spellbinds for every tourist. Sparking Sikkim tour package designed for you to explore famous destination of Sikkim and create new vision to reality. Holiday Travel India provides a new chance to explore Gangtok, Lachung and Chopta Valley in 05N/06D. The tour must going to be one of the most delightful tours. What is unique in Sparkling Sikkim Tour Package and why? 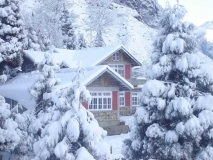 Holiday Travel India offers unique package to show beauty of Sikkim where you can find two famous city of Sikkim which includes Gangtok and Lanchung along with Chopta Valley. In this entire tour package we give a chance to explore worlds famous lake, Famous shrine of army soldier, snow-capped peaks Yumthang River and ancient Tungnath Temple. Arrive at airport or railway station and proceed towards Gangtok which is known as largest town of the Indian state of Sikkim. Upon arrival check into hotel and get ready to visit such famous sightseeing of Gangtok i.e. Ganesh Tok View Point, Tashi View Point and Hanuman Tok, Tsomgo Lake and Saramsa Garden. By the evening you will return back to Gangtok hotel and overnight stay with dinner at Gangtok hotel. After breakfast start your day by visit such famous and most awaited places that is Tsomgo Lake (38.5 km) which is one of the most popular attractions of Gangtok. Set at an elevation of 3780 m, this glacial lake is considered holy by Sikkim’s people. There is a temple dedicated to Lord Shiva located on the banks of the lake. After that you will move towards Baba Mandir which is a popular pilgrim center, Baba Mandir is believed to possess wish fulfilling powers. The shrine is built in the memory of Baba Harbhajan Singh, who was an Indian Army soldier and lost his life near Nathula Pass. It is believed that he is still ‘on duty’ for the Indian Army and he guards the lives of soldiers posted on the India- China border. Saramsa Garden: Saramsa Garden was established in 1922 and has served various purposes. This is a vast stretch of landscaped garden located about 14kms from Gangtok Town and near Ranipool. It's ideal for leisure, recreation and picnic. The purpose behind setting up of the garden was to cater to the needs of the British officers as well as the former Namgyal Royal family. Various fruit trees such as banana, orange, pineapple and guava were grown here. The Forest Department introduced Cephaelis Ipecacuanha, a medicinal plant in the year 1940. Tsomgo Lake: The glacial Tsomgo Lake is located at an altitude of 3,780 meters above sea level. It is also called as Changu Lake and is crossed by the Nathu la Pass on the north. This is one of the few and awesome high altitude lakes in India. The lake becomes doubly attractive with the reflections of the surrounding hills on the water. Tsomgo Lake is oval in shape and approximately 1km. long. It has an average depth of about 50 ft. it was created by the snow melted water from the mountains around the lake & a river namely Lungtze Chu has been created from Tsomgo Lake. The lake further falls into Rangpo-chu. By Air: Bagdogra is the nearest airport to Darjeeling. From Gangtok the distance of this airport is about 123 km. It takes about 4 ½ hours to drive from Darjeeling to Bagdogra. This airport can be reached from the metropolitan cities of India. By Rail: The nearest railway station to Gangtok is New Jalpaiguri or NJP. The distance between Gangtok and NJP is almost 88 km. It is the most important railhead of the region. This railway station can be reached from the major cities of India. The famous toy train can be taken from New Jalpaiguri to reach the hill station. It is a wonderful experience taking a ride of this train and enjoying the surrounding picturesque scenario. By Road: Bus services are available for tourists. After reaching Siliguri bus can be taken to reach Gangtok By availing the Tenzing Norgay Road, which is known as NH-55 Darjeeling can be reached from Siliguri, NJP and Bagdogra. It merely takes some more than 3 hours to reach Darjeeling via NH-55. Private taxis may be hired for this journey. Changu Lake is a glacial lake in the East Sikkim district of the Indian state of Sikkim, some 40 kilometers (25 m) from the capital Gangtok. Located at an elevation of 3,753 m (12,313 ft), the lake remains frozen during the winter season. You can hire Taxi to reach Changu Lake in very easiest way and taxi charges became Rs.3000/- on round trip. Lachung Monastery: The Lachung Monastery is the symbol of religious and cultural heritage. This place is known by the name Lachung Gompa which was established in 1880 AD. It is an ancient monastery where you can find Buddhist murals paintings with colors and two big prayer wheels. People perform various religious and traditional practices there. Chaam is the dance form which is performed by wearing peculiar masks. Lachung Gompa: The ancient monastery, which was built sometime during 1880, is the hub of all cultural and religious activity in Lachung. A quaint and pretty place with murals in jewel colours and two large prayer wheels, the gompa should definitely be on your itinerary. If you’re in the hamlet in January, then you’ll also be able to see the Chaam, a traditional masked dance that the monks perform here to mark the end of the eleventh Tibetan month. Sikkim is the only province in India where the majority of the population is Nepali and Tibetan. So it feels quite a bit different from mainland North or South India. After enjoying Tibetan cuisine at a number of restaurants in Gangtok. Taste of Tibet offers authentic Tibetan cuisine. Popular among the youth, the place is always bustling with people. Must-try dishes include Chicken Momos, Gyathuk and Thenthuk (noodle soup) and shyabhale (Tibetan meat pasty). The décor is simple, but the interiors are quite comfortable. Chopta Valley in north east Sikkim is very popular among trekkers as well as people of several faiths. Chopta is famous for its monuments of historical and religious importance. A few kilometers from the valley are the Gurudongmar Lake, considered sacred by both Buddhists and Sikhs. Situated close to the Indo-Tibetan border, the lake is special because a part of it never freezes even in the peak of winter. Chopta Valley can be easily reached from Thangu, which is located close to the valley. The drive from Thangu to Chopta Valley will take only forty five minutes, at a maximum. Jeeps and buses from the nearby town of Mangan, which is the main town in the district of North Sikkim. The best season for visiting Yumthang valley starts in late February and continues up to mid June, when thousands of colourful flowers are in full bloom. To enjoy a clear sky and brilliant view of snow-capped mountains, the September - December season would be ideal. Teesta Rivers are graded in the international level at I to IV and present one of the finest rafting starches in the world. The turbulent waters of Rangit with its multidimensional rapids provides the rafters the scopes of practicing their skills and the spectacular scene along the river courses through the gorges and valleys make the rafting adventure a memorable experience. A circuit of around 11-km, rafting starts from this quaint little town and continues till Rangpo through Sirwani. Above all, what attracts the adrenaline junkies for river rafting in Gangtok is the astounding views while challenging and maneuvering the ferocious rapids of Teesta River. Tosar Lake is located at an altitude of 13000 ft in between the Mangan Ridge and the Chola Range to the south east of the lake. This trek begins from the road head at Naksuk, Naga Reserved Forest above Naga village which is about an hour drive from Mangan. It follows the old traditional yak and cow trails in the Reserve forest. It passes through soggy temperate forest of broad leaved species and bamboos. This trek is especially popular for its mountain views, floral spectacle in summer, beautiful birds and views of pristine forest. Camp Mangan is a local family-run day camp that operates for 2-3 weeks every summer from late-June through mid-July. Camp Mangan 2017 runs from the 26th of June through the 7th of July. The Camp is in session from 9 A.M to 3 P.M with lunch and snacks provided. One of the prettiest sanctuaries in entire Sikkim, it is located in the Yumthang Valley, with the Yumthang Chu river meandering through it. Flanked by the Chomzomei Tso mountains, which extend till Lava on the west and by the craggy Chuba-Sagochen mountain on the east, the Shingba Rhododendron Sanctuary is well-known for its beautiful landscape comprising of verdant forested hills, alpine meadows, hot springs, flowering bushes and snow-peaked mountains. Several glacial streams criss-cross through the valley, adding to its charm. Spanning over an area of 43 sq km, this forest is especially known for over 40 species of Rhododendron bushes and trees. Other flowers like poppies, saxifrages, gentians, potentillas and primulas paint the sanctuary with their vibrant hues. If you’re in Lachung anytime between April and May – the time when the valley is bursting with a rainbow of colours, then don’t miss an opportunity to walk through the Shingba Rhododendron Sanctuary. While the forest is a floral paradise, it is also home to the Ghoral, Serow and the endangered Tiger-Civet. You can even spot the Brown Trout, an exotic species of fish in the blue waters of the Yumthang Chu. A beautiful valley of flowers with vibrant blossoms of primula, poppies and rhododendron. At a height of 3,564m, the valley is very near Tibet and offers some great views of the Shundu Tsenpa and Pauhunri peaks. As you walk around the valley, enjoying the views and your time in this floral haven, you’ll also come across several hot springs, which bubble with warm, sulphur-rich water, known for their healing powers. A tributary of the Teesta River meanders past the valley, making the place even more picturesque. While Yumthang is closed from December to March because of heavy snowfall, do visit the valley during the summer months when it is draped in a whorl of colours.